Here’s a quick update on our latest amazing accomplishments and events commemorating the 10th anniversary of the bombing of Earth First!ers Judi Bari and Darryl Cherney. Trial Date Set in Landmark Civil Rights Lawsuit! With trial in just 14 months, our goal of exposing the dramatic evidence that the FBI and Oakland Police conspired to illegally disrupt and destroy Earth First! 's campaign of mass organizing to save the old-growth redwood forests is finally within reach. 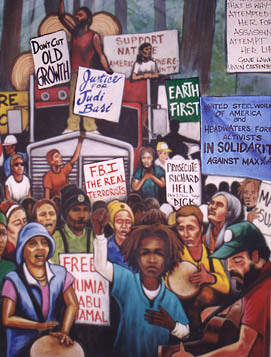 On May 24th, exactly ten years after the shrapnel-wrapped pipe bomb exploded under Judi Bari's driver’s seat, 350 people rallied outside the FBI field offices in San Francisco where "Squad 13" (also called the "Terrorist Squad") is based. Darryl Cherney and Morgan Fichter led the protest, joined by more than sixty other fiddlers and musicians including Darol Anger, Utah Phillips, Laurie Lewis, Mike Marshal, Kayla Flexer, and the amazing Clarridge Family. Art and Revolution’s 30?foot puppet of Judi and cardboard fiddles that spelled out “Who Bombed Judi Bari?” added to the extravaganza. Lead attorney Marvin Stender spoke to the crowd, fresh from a morning meeting with FBI attorneys calling for their release of illegally withheld documents. On May 19th in Berkeley we hosted "Targets of COINTELPRO" a historic meeting of people and movements that have been targeted by the FBI. Speakers included Geronimo ji jaga (Black Panther Party), John Trudell (American Indian Movement), Alicia Rodriguez & José Lopez (Puerto Rican Independence Movement), Karen Pickett (Earth First! ), and Peter Bohmer (professor and anti-war activist). All had been targeted by the kind of FBI counter-intelligence operations perfected by Richard W. Held who, as Special Agent in Charge of the San Francisco FBI office, supervised the Judi Bari bombing case. Held is notorious for his role in neutralizing activists and groups in the social change and liberation movements of the 1960s and 70's. He was personally responsible for framing and imprisoning Geronimo ji jaga and AIM leader Leonard Peltier, as well as the assassination of members of the Puerto Rican independence movement. The event was an eye-opener, with new revelations of the treacherous tactics used by the FBI to try to destroy grassroots resistance movements. Among other 10th anniversary events was a 25-city tour, bringing the story of the FBI’s dirty dealings with Earth First! to activists around the country. We also broke through the press “white-out” on the case with features in the Oakland Tribune, Santa Rosa Press Democrat and the San Francisco Daily Journal. Portland’s public radio station KBOO did a 3-hour special broadcast on the 24th, and "Democracy Now!" Pacifica Network's award-winning national radio news show, featured an hour?long radio documentary "Judi Bari: Revolutionary Ecology." P.S. --- Help us build solidarity for this case among the movements and communities long-targeted by FBI wrongdoing. Please let us know if you can host an event, place a media story or do a solidarity action in your own community. P.P.S. --- A limited number of cassette tapes of "Judi Bari: Revolutionary Ecology," the radio documentary featured on Democracy Now! have been donated to Redwood Summer Justice Project. We’ll send you one for your contribution of $100 or more.